This was a huge grower. On first listen I was ready to write it off as “better than Peep, worse than Wicca”, which I now see is wrong – he’s arguably the very best in this blossoming genre. Reaper has a highly polished sound that wears its influences in such a clear and effective way. 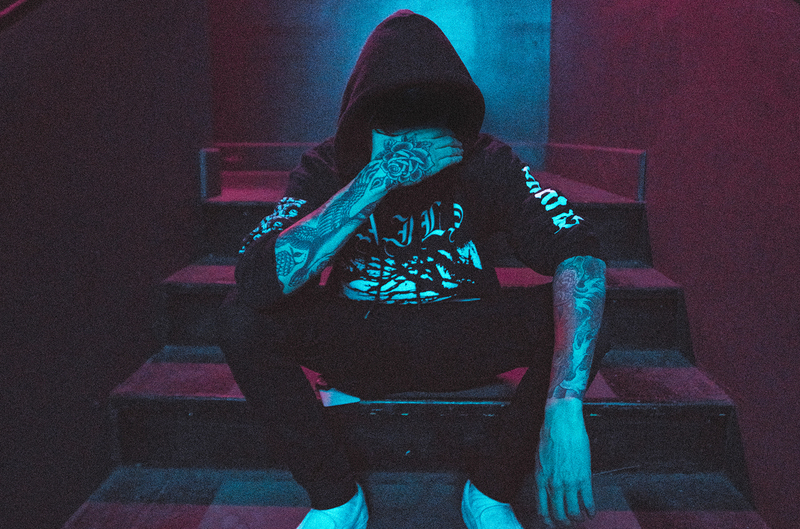 There’s been a lot of talk over the last few years about sad rap/emo trap/whatever other name for this controversial new hybrid, but nothing,nowhere. is the first to make this leap forward in defining the sound, while dramatically raising the admittedly low bar. Taking a riff on a tried and true rap technique of structuring songs around a sample, n,n. opts to do this instead over a melancholy guitar phrase of his own making. There’s an amateurish home-recording quality to them that’s incredibly genuine and endearing. They call to mind the stripped down sorrows of slowcore legends Red House Painters, but with a 3rd wave emo sensibility. This is the core of his sound and it perfectly captures the depressive atmosphere he’s stuck in. In the beat department Reaper most frequently employs the mid tempos, rattling hi-hats, and deep bass hits of trap rap, as well as the daydreamy hodgepodge production of cloud rap. The track Funeral Fantasy is a slight departure using some really clean and simple boom bap, easily the most upbeat and shareable song on the album despite the subject matter. As a vocalist he impresses over and over again. He’s got a cheerless low end that exists as one with the song’s pacing, a fast rapping flow, and just the right degree of tortured whining for a chorus about ill wishes for an ex lover. These addictive sing-along bars and pop structures belie what is actually a very dark album. Almost every single song is about depression and suicide. It’s persistent to a point where it can’t possibly be an act, and just like his guitar playing, it feels very genuine. This guy is struggling, probably why Reaper hits home with me in such a big way. He says he’s “got this feeling I wont make it to 25”, and in light of the recent passing of Lil Peep, we can’t dismiss that as conjecture. Something else that about the lyrics that stood out to me is the strict avoidance of braggadocio that’s so ubiquitous in rap and hip hop. Something that irked me about Lil Peep’s music that held me back from being a full fan is his lazy and problematic lyrics, whereas n,n. manages to craft genuinely effecting prose and only once drops an unnecessary brow furrower. Despite how much it clicked for me, I don’t think this is an album I can recommend to most people. The genre tags alone will turn most people off, and if those don’t the overly mopey lyrics/singing probably will. Even for me it was a bit of a guilty pleasure at first, but I’ve listened to it so much I couldn’t possibly exclude it. One of the poppier tracks, Hopes Up, has a guest appearance by Chris Carrabba of Dashboard Confessional that I shouldn’t love as much as I do. The only track that’s a genuine stinker that I skip almost every time is REM (feat. Lil West). Its egregious use of autotune and cringy lyrics is too much even for me, and I’m a gigantic sap. Aside from some qualms, this album is actually really damn strong, and the current paragon of emo trap as far as I’m concerned. Check it out.